(UPDATE 5/13/16) And then there were four. With the San Jose Sharks' 5-0 victory over the Nashville Predators in Game 7 Thursday night, the stage is now officially set for the Conference Finals of the 2016 NHL Playoffs. The Sharks will take on the St. Louis Blues in the West while the Pittsburgh Penguins match up with the Tampa Bay Lightning in the East. It is a particularly interesting time to be a NHL fan. While the Penguins and Lightning have each raised the Stanley Cup at least once in their respective franchise's history, neither the Sharks nor Blues have ever done so. It appears that prior playoff success is helping the Penguins on the secondary ticket market, too, as the team's high Stanley Cup odds and relatively affording ticket prices again make them the best deal in the NHL through the third round. We have rated each team's value through the third round of the playoffs. The lower the final value, the better the deal is for fans. The Penguins have the greatest value at .48 during their series with the Lightning, who sit on the opposite side of the spectrum with 1.58 value index. (UPDATE 5/3/16) The First Round of the 2016 NHL Playoffs left no stone unturned, as historic advances, thrilling upsets and a pair of Game 7s set the tone early. Eight teams remain in their quest to hoist Lord Stanley, and it appears that the Second Round belongs to the Pittsburgh Penguins - at least in terms of best value, that is. 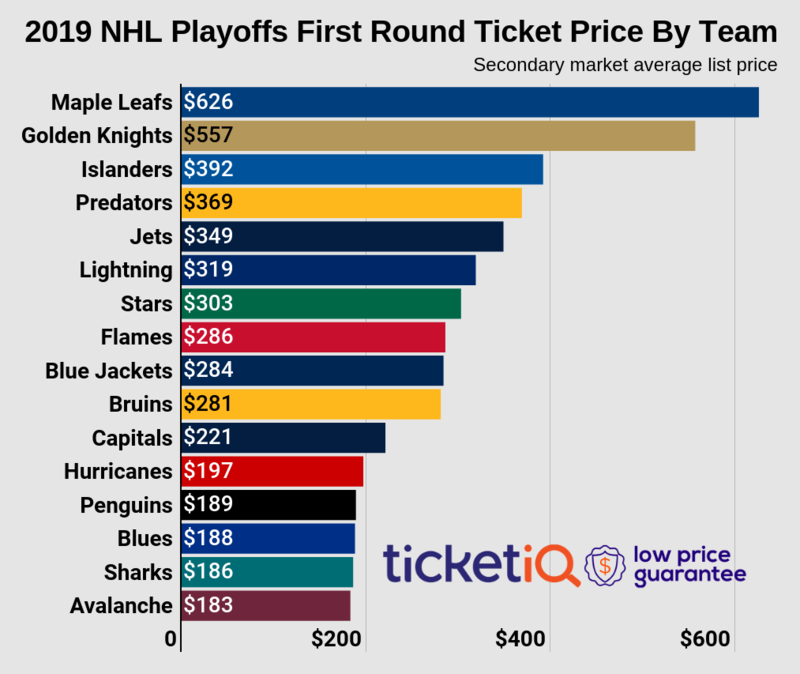 Earlier this postseason we broke down which teams give their fans the best bang for their buck by looking at average price for 2016 NHL Playoff tickets at home and Stanley Cup odds. By multiplying average price by odds and dividing that number by 1,000, each team received a "value", or finite number to equate the fan base that receives the best return for what they pay for. The lower the number, the better the value, and the Washington Capitals owned the best in the league through the First Round. With the Penguins owning the series lead against the Presidents' Trophy-winning Capitals, it appears that expectations are high for the Stanley Cup to make its return to Pittsburgh. The game of hockey is an unpredictable one, however, and though several teams have long odds at claiming their next title, no one can be counted out until the final horn of the series blows. (ORIGINALLY PUBLISHED 4/22/16) It’s that time of year again – intensity picks up, facial hair begins to grow and dreams of hoisting Lord Stanley swirl in the minds of 16 NHL teams. For fans, the harrowing experience of the NHL Playoffs brings forth a gambit of emotions, from the elation of a big win to the frustration of an overtime loss. Patience is certainly tested, but one question remains; which fan base is getting the best bang for their buck during the 2016 NHL Playoffs? Looking at secondary market data for NHL Playoff tickets provided by online aggregator TicketIQ and VegasInsider's Stanley Cup odds for each team, it appears that the Presidents’ Trophy-winning Washington Capitals provide the best value for the greatest return this postseason. At the other end of the spectrum sit the New York Rangers, whose exorbitant ticket prices at Madison Square Garden and long odds at the Stanley Cup make them one of the worst deals in the playoffs this season. The above graphic depicts each team’s home ticket average during the first round on the secondary market as well as their odds of winning the Stanley Cup. Perhaps expectedly, the Rangers lead the list with a whopping home average of $518.50, though at 18/1 odds leave fans paying big prices for what will likely result in an early exit. Washington Capitals playoff tickets, however, are the ninth most expensive in the opening round of play at an average price of $234.72 at Verizon Center. With 11/4 odds to win it all, the Capitals serve as the best deal through the Quarterfinals. Such a claim is better represented through the team-by-team value index, which can be seen below. These numbers illustrate which fan bases receive the best value by multiplying each team’s first-round ticket price average at home by their Stanley Cup odds and then dividing that number by 1,000. The lower the number, the better the value, and the Capitals lead the list with a .65 value. Interestingly enough, while the Rangers own a 9.3 rating on the value index, they aren’t the team with the worst value from a ticketing and competitive standpoint this postseason. That honor belongs to the Philadelphia Flyers, who typically post high ticket prices at Wells Fargo Center and have the worst odds of winning the Stanley Cup at 200/1. Their 48.7 rating is far-and-away the worst value in the league. That number is certainly impacted by their first-round opponent in the Washington Capitals as well, who are clear favorites to win their first Cup in franchise history this season. Other notable teams on the value index include the Detroit Red Wings and Minnesota Wild. Prior to being eliminated by the Tampa Bay Lightning on Thursday night, the Red Wings were second to the Flyers as the worst value in the 2016 NHL Playoffs with a 12.8 rating. That number is interesting considering the team’s continuous regular season success and record 25th consecutive playoff appearance, which didn’t seem to translate into a deep playoff run. Like the Flyers, the Wild typically own big ticket prices during the regular season and have the fourth highest average ticket price during the first round. Their 50/1 Stanley Cup odds make them the third-worst value at a 12.8 rating. The Capitals may offer the best value to their fans, but several teams trail closely behind through the first round of play. Anaheim Ducks playoff tickets at Honda Center are the cheapest of the Quarterfinals at $145.11, and though the team has 12/1 odds at raising the Cup, they have the second-best value index with a .8 rating. The San Jose Sharks and Dallas Stars follow at respective ratings of 1.3 and 1.5. Of course, plenty of hockey is left to play, and it remains to be seen if the Capitals have enough to win it all come June. For fans, however, they'll gladly enjoy the ride - and the value that comes with the franchise's potential first Stanley Cup.